Curious about that “blob” you see in the water? Meet the bryozoans! Bryozoans are tiny colonial invertebrate animals belonging to the phylum ‘bryozoa’, and are also known as “moss animals”. There are 20 freshwater species worldwide. 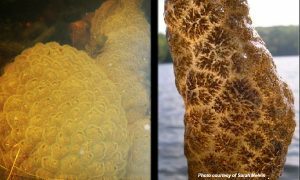 A bryozoan colony, consisting of individuals called zooids, may resemble a brain-like gelatinous mass and be as big as a football, and can usually be found in shallow, protected areas of lakes, ponds, streams and rivers, and is often attached to things like a mooring line, a stick, or a dock post, etc. Zooids feed by filtering tiny algae, protozoa, photosynthetic bacteria, small nematodes, and microscopic crustaceans from the water. Tentacles help capture prey and create currents that draw food toward the mouth. Bryozoans are simultaneous hermaphrodites, with individual zooids functioning first as males and then as females. Colonies contain zooids in both male and female stages. Sperm from male zooids exit into the water through pores in the tips of some of the tentacles, and then are captured by the feeding currents of egg-producing female zooids. Bryozoans are usually an indicator of good water quality, and should not be disturbed or removed from the water.